Yesterday I spent the entire day at the Boston Design Center working on my project for class. There is soooo much to pick from. It's really hard for my crazy ADD self to focus just on one thing, I want it ALL! While my project is slowly coming along, I didn't make any final decisions yet. But what I did make is a final decision on is what my future house second bathroom will look like. I've got the wallpaper and tile all ready to go...one little detail, I just need the bathroom to put them in. I'm in LOVE, like I have to have it now kinda feeling. I even brought home a sample of the green one just to show the husband. I 100% expected him to tell me it was awful and give it the thumbs down. But, to my wonderful surprise he actually liked it. He laughed when he saw it and said "yea that is really cute, I like it." I'll take that as the green light and place my order now. You know you would too. Yay for frog wallpaper! I love both combinations here. The green paper looks so different on screen from how it looks in person—the sample you took home really was amazing! They are both awesome but I vote for white froggies with green tile. That wallpaper is SO COOL! Sweet lord. If I find something like that with turtles on it, it will be in my house IMMEDIATELY. That is adorable!! Oh my gosh - Option #2 is absolutely amazing. Wow!! It's always great when a husband and wife are on the same page with decorating...and, if you're taking opinions, I'm absolutely crazy for the green froggy wallpaper with the black and white tile. Me and my hubby are still arguing about whether we got the right shade of creme on the walls from 4 years ago, i guess we'd be better off getting a professional in and not arguing with them, i maintain, he chose the wrong shade! I love the black and white tiles! That wallpaper is great! I especially like the green. Cara I had no idea?!? That is a total friggin bummer- damn those people who dont like green tile! I love those frogs...very quirky!! 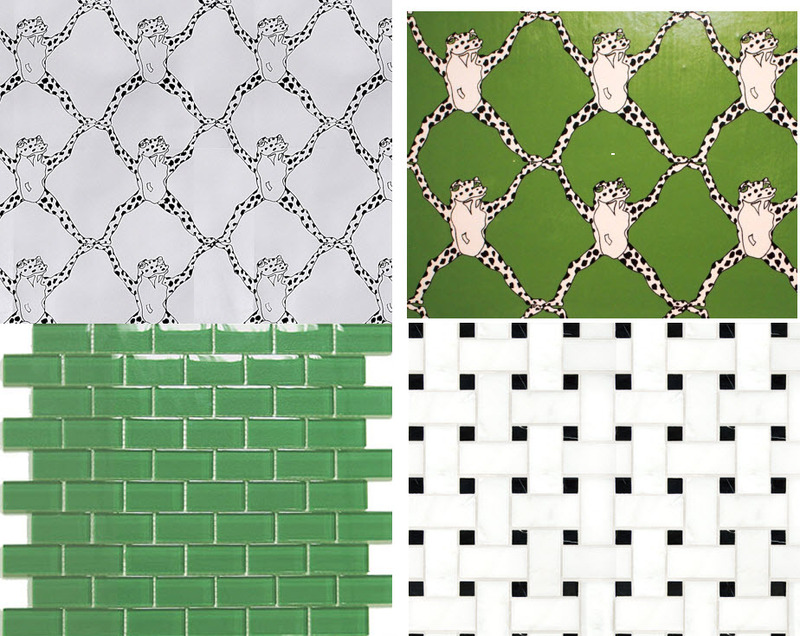 Green Frogs and white tile!! I love it! Bravo! This is a super exciting start! I hope we get to see more soon!! I vote green paper black/ white tile. That way you can always change the paper and have a more neutral tile. You might not like the green tile after a few years. Green frogs, black & white tile. Anon, its a Brunschwig & Fils paper called Frog Treillage. I hate to be the bearer of bad news, but I think its discountinued :( I can try searching for some left over if you want- just email me!